Vernon is using Smore newsletters to spread the word online. Three more days before break - I believe there is a Frank Sinatra song there! We have three more days before the Holiday Break. Students are excited and anxious for the week and half long recess. A few items of note - our music department, with information below, has been on fire with performances throughout the month and around the community. Our service clubs - Key Club, Interact, FBLA, and Student Government have been conducting various canned food drives, hygiene product drives, Salvation Army Angel Tree collection, and a Penny War for various community agencies. Special note, the Penny War is between myself, Mrs. Hartmann and Mr. Jordan. The lucky winner will get to wear an Elf, Snowman/woman or Gingerbread man/woman costume on Wednesday. And, this Wednesday, we will wrap up 2015 with a special Holiday Pep Rally for students and staff. It will be jam-packed, three-day week. December - A Month of Music Student Performances! In the month of December…. Incredible music performances from all Canandaigua students! 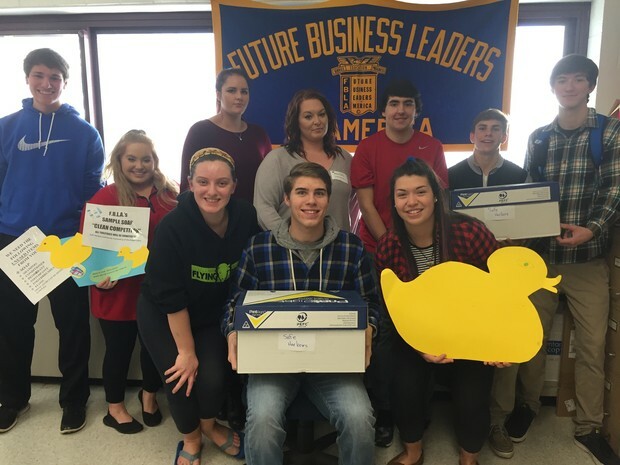 The Future Business Leaders of America CA Chapter’s Sample Soap “Clean Competition” was very successful. They were able to collect and donate 35 pounds of items each to two local charities. Items included shampoos, conditioners, bath soaps, deodorant, dental care items, baby soaps, shampoos, and body lotions. Danyale Clawson and Jennifer Obzud were representatives from Family Counseling of the Finger Lakes. Melissa Gilbert was the representative from Safe Harbors. 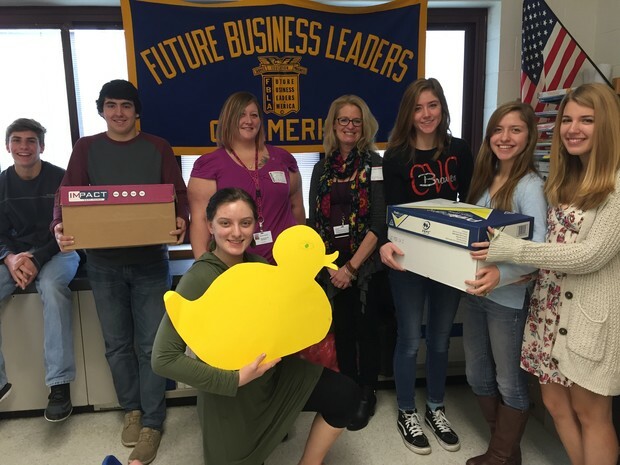 FBLA gives a special thank you to all for helping them assist these two very important groups in our community. 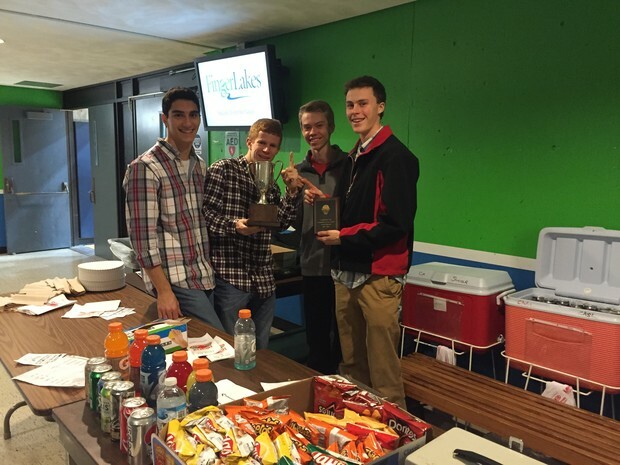 Cam DeMott, Connor Griffin, Josh Peterson, and Nate Barott volunteered Friday night at the Commodore Cup for Key Club, working the concessions stands and admissions. The four are pictured with the trophy and one of the awards for either Grant Emerson or Lindsay Lyke who were presented with this year's Community Assist award for their overall service and commitment to CA. The transition from 8th grade to 9th and 10th to 11th are the two biggest changes for Academy students. In the grade 8 to 9, students are moving to the Academy. For the first time, every course they take has a direct impact on graduation and college. Starting in grade 11, students have entire paths open for them, be it the Advanced Placement coursework, International Baccalaureate Program, College Level Courses, Finger Lakes Technical Programs as well as many elective opportunities in all disciplines. Because both are truly dynamic transition periods for your child, we invite you to attend our Curriculum Night on Wednesday, January 13 @ 6:30 PM. The evening will start in the Academy Auditorium. Speakers from each academic and counseling department will be on hand to explain the Academic Road your child is about to embark on. Please join us. Below is a brief schedule for the evening. More information will be posted on our website soon. After the holiday vacation, all tenth grade students will take a survey indicating their interest for more information in the IB Diploma program. Attending Camp IB on Tuesday, January 19 at 7:00 pm in the Academy LGI. This is the primary promotional event for families seeking to learning more information about the program. The IB Coordinator, students and parents will speak on their perspectives on the program. College representatives will be on hand to discuss the benefits of the IB for college-bound students. NB: This is the correct date. The District calendar has the date incorrectly reported. Reading our IB Diploma FAQs. Watching the Screencast of last year’s Camp IB presentation. Monday will be an "B" Day. This will be my last newsletter until January. For a printer friendly copy, please click here.